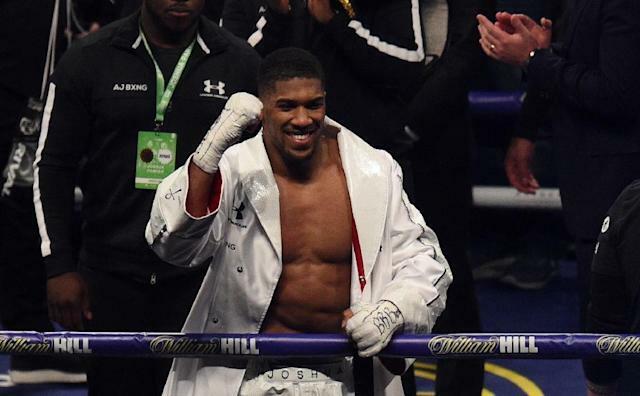 London (AFP) - Anthony Joshua believes he would be forced to quit boxing if the heavyweight champion ever endured the kind of doping scandals that have engulfed Alexander Povetkin. Povetkin's presence as the mandatory opponent for British star Joshua at Wembley on September 22 has infuriated fans, who feel he shouldn't be allowed back on the big stage after his drug issues. The 38-year-old Russian tested positive for meldonium in May 2016, the same banned substance compatriot Maria Sharapova was suspended for taking. The failed test led to his scheduled fight against Deontay Wilder being scrapped before the WBC accepted the explanation that he stopped taking the drug before it was on the banned list that year. That wasn't the only black mark against Povetkin and, in December 2016, he was found to have taken a banned muscle-building drug called ostarine. He was suspended from WBC-sanctioned fights after the second failed test, but appealed and was allowed back into the sport with a year-long ban and a £188,000 ($245,000) fine. Both fighters have signed up to the Voluntary Anti-Doping Association's (VADA) programme ahead of their Wembley date and have been tested twice. But reigning WBA, IBF and WBO champion Joshua -- who has never been linked with doping -- claims a fighter of his profile would be made to pay a heavy price if he was found to be involved with substance abuse. "I would never be able to box again because I would be made an example of. If I missed a drugs test or am an hour late then people will say 'Oh, he must have been doping'," he told reporters at Wembley on Wednesday. "I am not the lawmaker on that stuff. I would rather take a loss than be done for doping; being done for doping is far worse for your legacy than taking a loss. "I don't see doping as a way of making yourself better - if a person is better than you then work harder, train harder, you don't need to dope. "Weigh it up; doping, being banned, legacy damaged. Or someone is better than you on the night, give them the respect and bounce back. "I would rather stay clean and give it my best every time. "If I got done for doping -- it would never happen -- then they would deal with me." However, Povetkin is adamant he did nothing wrong on either occasion and therefore shouldn't be regarded with suspicion when he faces Joshua. "First of all, I have been cleared of that suspension. I have been justified. And the court case that was ongoing with the team of Wilder has finished in our favour," Povetkin said. "For me it was very, very suspicious. I know that I am clean. I know that I was clean back then. All I can say is that I was accused of wrongdoing when I wasn't. "After the first time I was caught I signed a secondary anti-doping full-time testing programme. Then what did I do? Right before the fight I licked some meldonium or some ostarine to have no affect and be caught with it right before the fight. "Does is sound realistic to you? The amount they found doesn't give any affect so why would I ever want to do that. "I have nothing to do with it, and I am very well deserved of the fight I am getting." Povetkin isn't the only Russian to have been tarnished by allegations of doping in recent years. Forty seven Russian athletes and coaches were banned from this year's Winter Olympics after an investigation into state-sponsored doping during the 2014 Games in Sochi. But Povetkin doesn't believe the problem of doping in Russia is as bad as claimed. "I don't think that our sportsman in Russia consume all those things they are accused of. It's a bit annoying to be honest," he said.